There are already plenty of iPad apps that introduce kids to nature, but it’s always nice to find ones that are both beautiful and educational. 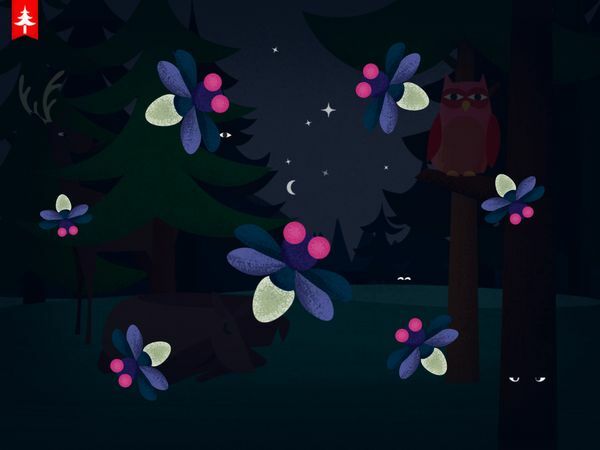 Recently I had the opportunity to try Kapu Forest, a lovely toy app by developer Kapu Toys, which introduces kids to various animals that live in the forest. Opening the app for the first time, kids will be greeted with a panoramic view of the forest. They can drag the screen left or right to explore the forest deeper, and meet the 12 animals living there. Tapping on each animal will lead to a mini activity. Aimed at kids ages 1–4, the activities are on the simpler side. In one activity, for example, kids feed a squirrel an acorn by tapping on him repeatedly. In another, they feed a fox by dragging the berries from a bush and into his mouth. A slightly more complicated activity is the one with the beaver, where kids must drag colorful shapes from the river to patch his dam. There are also mazes where kids drag objects using their fingers (or optionally, tilt the device) to guide them through a winding path. Once kids complete an activity, the app rewards them with a cheerful animation and sound effects. They can then choose another animal, or if they’d like, replay the activity. There are no rules, really, so kids can explore the app at their own pace. Kapu Forest is a simple and straightforward app. It doesn’t use any text and narration in the gameplay, making it suitable for kids of all reading levels, and for non-English speakers as well. An interesting feature is the timer which lets parents set how long kids can play. They can set the timer as short as 5 minutes, or as long as 30 minutes. The app will display a static night scene when the time limit is exhausted. Additionally, parents can download a couple of free iPad wallpapers featuring the forest animals, which is a nice touch. The app doesn’t have ads or in-app purchases, and the parents-only section is protected. Promoted as a colorful and fun digital toy for young kids, Kapu Forest does its job really well. The graphics/animation department is where the app shines the most, and indeed this is one of the more beautiful apps I’ve come across on the App Store. The activities themselves are enjoyable and appropriate for toddlers and preschoolers. There are many different things to do and learn; for example, in the bee activity kids can see how bees collect honey from flowers and bring it back to their beehives. They also learn to sort items by colors in the deer activity. My favorite activity, however, is the one where kids can tap on fireflies to see them glow in the dark. Living in a bustling city, this is a rare treat that I very much appreciate. Finally, if there were one thing to improve in the app it would be to add more animals and activities. It would also be nice if there were more nightly activities, similar to the one with the fireflies, to make this app more bedtime-friendly. Kapu Forest is a simple, beautiful toy that introduce toddlers and preschoolers to the forest. Kids can play with 10 forest animals, and help them with various tasks such as gathering food and building nests. Parents don’t need to worry about screen time as the app allows them to set a time limit.